Now I have many faults, I admit most of them, but there is one that I do try and hide, or at least do not acknowledge either as being a fault, or as even existing. In my case this is compounded by an increasing desire to do silly things, just for the hell of it. This is when “Dishonest Abe” makes his appearance. The original D.A. is a character from a book by Alfred Bester, which I heartily recommend – it is “The Demolished Man” and is well worth a read. The problem with Dishonest Abe is that he has a particularly well developed sense of the ridiculous and is also quite happy to tell tall tales. As Dishonest Abe I will happily encourage someone to believe some quite wild nugget of information. In fact the wilder and more unlikely the piece the more compelling it becomes to assure my listener that it is strange but true. The phrase “A little known fact” is often included and is a sure warning that yet another untruth is about to spill from my lips. There is nothing to gain from all this, so why on earth do I do it? I honestly have no idea. I never make money from it or indeed profit in any way, but it suddenly becomes quite compulsive. Perhaps the best way to give you an insight is to give you some examples of Dishonest Abe in full flow and then you might get an idea what to watch out for if we should ever cross paths. Now I am possibly one of the world’s worst gardeners – suffering from Black thumb rather than green fingers. Nevertheless I have from time to time attempted to grow a few tomatoes or herbs – generally with extremely disappointing results. This year, encouraged by mad g reen eco-warriors and keen gardening neighbours I have actually got some tomato, courgette and cucumber plants all busily sprouting in bags of compost at the bottom of the garden. Not to be outdone, Da Boss announced that she was going to grow potatoes in a bag and happily got stuck in. Everything was done strictly according to some advice she had been given and every few days as the leaves started to emerge she had me adding another layer of potting compost on top of them. Soon that was accompanied by lavish watering and yet more compost as the blasted things grew like wildfire. Eventually we had given these potatoes the best possible start in life and all we had to do was wait until they flowered. That would be the sign that soon we would have fresh delicious spuds, better than anything we had tasted. Week after week passed and the bloody plants refused to flower. So, at the end of last week it was finally time to dig out the first crop and I sneaked out whilst Da Boss prepared for the unearthing of her first spuds of the year. When I came back a while later there was no mention of the harvest, so I said nothing. I winced. This didn’t sound too good, but I said nothing. I realised my mistake as soon as the words left my lips. Da Boss’s face was as impassive as could be and that meant only one thing. She lifted a small bowl that had been lying upside down on the side. I stared. In front of me were four of the smallest potatoes I had ever seen. The largest was just about as big as a quail’s egg and the smallest was the size of a baby’s first tooth when they fall out. That was when I made my second mistake. But I just couldn’t help it. I burst out laughing and although I knew it was cruel I couldn’t help commenting on the sheer cost per ounce of these few spuds. More than anything though it was the look of sheer disgust on Da Boss’s face that these plants had dared to perform so badly that kept cracking me up. Now Da Boss hasn’t dug up all the potatoes. The first plunge into the tub was enough to dishearten her and I was not so stupid as to even suggest that we dig out the remainder and put it all down to bad luck. All would have been well if I hadn’t just happened to be in a slightly silly mood this evening. 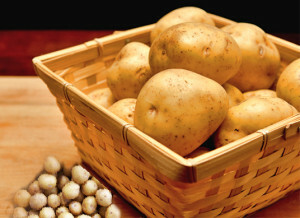 But I was, and when I had to pop along to the local supermarket for a couple of things for supper I saw some new potatoes on offer. That’s when Dishonest Abe took over! OK – you’re ahead of me already, aren’t you? You’ve guessed what’s going to happen – admit it! And it is going to happen! Nothing will let me stop at this point – even though it is cruel and will very probably get me into big trouble when the truth finally emerges. 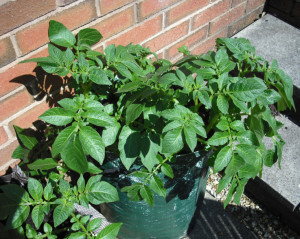 Later this evening or very early tomorrow morning I shall be salting the potato pot with new potatoes ready to be dug up later on. I shall be as surprised nay shocked as anyone and then celebrate Da Boss’s apparent victory against all the odds. But now I have to think about just when and how I get Da Boss to dig out the remaining spuds. If I simply marched in with them then she would smell a rat. On the other hand if it is her hand that actually scoops the spuds out of the soil then I am sure she will beam at me triumphantly and berate me for thinking that she could ever be beaten by a humble potato plant. And this is where I admit yet another nasty side of my character to you. For, you see, you too are now my accomplices in this devilish plot. I have told you before the event and you will have to share my wickedness. Yes, by letting you in on things ahead of time I have drawn you unwittingly into my net of deceit and when my wicked ways are finally revealed to Da Boss she will also find out that you all knew from the start! There’s nothing quite like spreading the blame is there? I feel just like I used to do when I went swimming in the freezing sea as a kid. When friends asked what the water was like I would cheerily shout out that it was fantastic and was much warmer just a few yards out from the shore. Then when they plunged in and started to turn blue and cursed me furiously I should have realized that Luke had begun to emerge as one of my alter egos! I shall stop now, but I promise you that I will keep you up to date as the story unfolds – after all, there’s nothing like watching a little bit of mischief – is there?